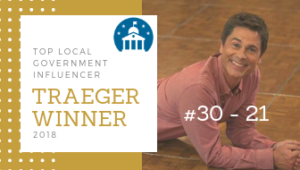 The ELGL Chris Traeger Award recognizes the top influences in local government. The award is named for Chris Traeger, the city manager for the fictional City of Pawnee, Indiana on the show "Park and Recreation." He was known for extreme energy and commitment to improving local government. The Traeger List is not based on title or longevity. It’s based on an individual’s influence in their community and outside their community through professional associations, mentoring, and writing. 2018 is a record-breaking year for the Chris Traeger Award! Local government professionals from across the country submitted a record number of nominations. Just like 2017, we're empowering ELGL members to select the Top 10 of the 2018 Chris Traeger Award. Review the list of nominees and submit your vote for the top 10. Any current ELGL member is eligible to vote. Not a member, you can join here and then submit your vote. This year, we will empower ELGL members to select the top ten of the Traeger List. The Traeger List was featured by newspapers including the Roanoke Times, News and Observer, The Journal News, Coeur d’Alene Press, Village of Richfield, WI, and West Bend Daily. GovLoop recognized ELGL as a top professional association. StateTech named the ELGL website a must-read for state and local government information. The Oregonian featured ELGL’s commitment to gender equality and collaboration in local government.